Huge quantity of cables? Lots of small PC accessories? Take so much time to deal with when you on holiday of on travel? Not a problem anymore. This Ecosusi neat little storage bag fixed that. There's a zippered see thru pouch, which perfectly fits extra battery pack. Thumb drives, or SM cards, can be stored there too, or under the netting on the other side. Then, your USB chords, or power adapters, are stored under the elastic bands that stretch across the middle of the pack on both sides. How to pack the cables? 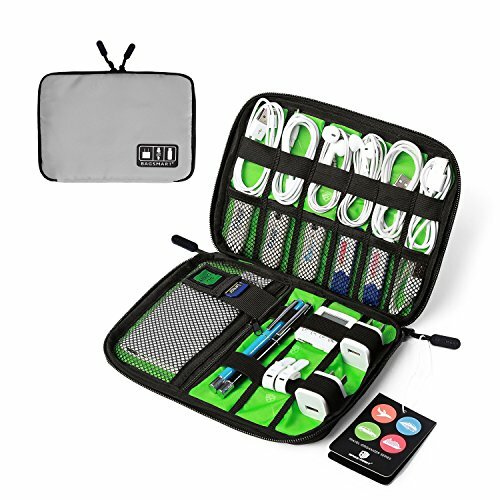 This storage bag has quite a few compartments for storing various items with an outer size of about 22cm by just over 15cm it's big enough to carry a good quantity of cables/parts but compact enough to carry around easily. On the left side six segments with elasticized sections and bottom clear mesh parts, over on the right the same style but 3 larger areas with a zipped area at the bottom (this can fit a 2.5" portable hard drive) in this area you have an "SD card pouch" too. The outer casing has some padding on it, with a decent quality zip and pull tab on it. What you store in this is up to yourself. Cable ties, SATA cables, Molex to SATA power converter cables/splitters ARE ok. In the bottom part you put a ribbon cable, screws/motherboard risers, grommets etc. But you can also store other items like USB sticks, pens, a slimmer torch etc. Even filling the organizer up it closes easily and the cables and other parts are stored securely. It's a great idea and it also encourages you to start disposing of items you don't want. It's convenient as you can simply go straight for this case, rather than hunting around for items in a larger bag. Pretty much an essential item if you have a lot of cables and work on computers. Quality is very good the design and layout will suit a variety of needs.